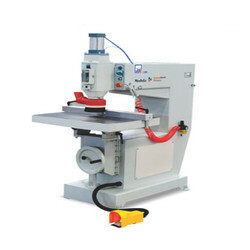 Manufacturer of a wide range of products which include high speed router wood working machine j-903. Designed for high speed production routing for getting clean, fast cuts when routing, moulding, making dovetails, grooving, mortising, tenoning & rebatting. Ground and electronally balanced spindle for vibration free operations. Engraving can be done on workpiece by copying the design of master jig.